We almost gave this post the title "News: Good and Bad," but then we decided that would be much too loaded. Instead, we gave it an innocuous title and left our opinion very mildly disguised. This one is sure to be a doosy. 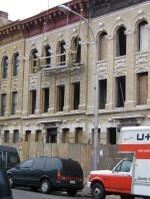 The news is that these two buildings, though undergoing simultaneous renovations, are completely unrelated. The building on the left was purchased by a developer who will sell off units as condos. The building on the right is owned by the city. Ultimate use for the building is unclear, but it goes without saying that it will be part of some city housing project. It could be used for people without homes or city employees - to name a couple of possibilities. The city runs many nuanced housing programs, and without further investigation it's unclear what this building will be used for... though we probably shouldn't say so, we're hoping it's not transitional housing. Housing project? Oh what fun! This ought to speed a long the Rogers Avenue development plan. A walk down Rogers in the near future: cafe, boutique, cafe, boutique, crack pipe, cafe, boutique... Can't wait! Great. I suppose green was a trifle to tasty for a cardboard curtain half-way-house. What a turd of immaculate nonsense scooped by the hands of an all forgiving, ever loving idiostocrasy. Where can i stuff my autogenerated replies? Ouch. Endless slicks of degenarate urine running through happy gutters! More of the same please El Capitan. More of the same. Oh, please guys, give it a chance! One building will be condos, which could be great, depending on their finishes/prices. As for the city-owned building, the purpose isn't sure yet -- but city employee housing could be great -- keeping middle-income people and families in our neighborhood. This could be a step towards ending the seemingly inevitable exclusion of the people who make our lives work (subway conductors and motorists, sanitation workers, police and fire fighters, etc.) from New York City. And in terms of "transitional housing," down on one's luck doesn't necessarily equal criminal element. If we had a City Council person, we'd have someone who might be able to find out for us what plans the City actually has. Who else could we ask? Marty's office? Board 9? 311? ATP: could you please post the address of the City-owned building? 411 Rogers Avenue appears to be owned by "411 Rogers Avenue LLC". On 415 Rogers, there seems to be a recent agreement between HUD and "Emmanuel 203K, LLC". I believe 203K refers to a HUD building rehabilitation program for dilapidated buildings. If the rumor is indeed correct, the violent nature of an unrewarded ransom has quite resulted in my beloved guitar, having it's neck mercilessly snapped and it's eternity glass feminine body being thrown carelessly as lettuce onto the ice sheet directly in front of the boathouse, to be pitied I suppose, or arouse some opulent anger in which I will no longer participate, until the ice melts in downward sun strokes, much like the chomp-chomp revelatory delight of banging out awkward chords with virginal hurt of fingers, where you will be tilted, first love, feverish towards a budding sky once more, and pulled downward to the feathered bed, towards quarter and holy rest. I should have loved you more. Goodbye. Boiling frogs? Violently snapping necks of "feminine" bodied guitars and discarding of them by the boathouse? Should we be forwarding your poetry to the precinct, Harry? Harry, the controversy you're causing is, I'm afraid, more of a grammatical nature. It's = it is. This is not the possessive. That little glitch adds an unwelcome and inappropriate bemol to your otherwise creatively dissonant and inspirinlgy abstruse stream of consciousness ramblings. My sympathies on the loss (I think) of your guitar and I hope you enjoyed you broiled (sic) frog, although I prefer their cuisses sautees. If anyone has seen an Inconvenient Truth they would know exactly what I was referring to with the boiled frog and if anyone has been to the boathouse lately they would know exactly what I was referring to about my kidnapped guitar. Grammar and rivers don't mix and for lack untying an already sown thread, I can't apologize but thnak ew fur ur cwoncwern. Ed, I know your kidding but your beginning to sound like the curator for a degenerate art show in Munich circa 1937. Why do you hurt me so with undeserved tongue lashings? Can't you see I'm in a fragile state after losing something I loved? Mea culpa as far as An Inconvenient Truth is concerned -- I really wanted to go to K-Dog's the other night but couldn't make it. Ditto venturing to the Boathouse lately -- the vicissitudes of work unfortunately (not to mention a certain apparent blogging fixation and an intense dislike of cold weather, although I much prefer it to apocalyptic warmth). And grammar IS a river, and properly navigating it is like shooting some wild rapids -- Yeah! Check out that third conditional with a past subjunctive! Woo hoo! Anyway, Harry, who really gets all the culural references in any great poet's works? Awwww...sorry Harry. I didn't mean to hurt your feelings. Let's kiss and make up, but no tongue, please. Are posts no longer being moderated? What happened? No Owen, posts are being moderated. Clearly, moderating is still necesary as you share an IP address with the profanity poster. Ed, I want to lick you like flypaper in a Bangkok fish market in gratitude of your cradling noddles. Babs, your grammatical prowess is beyond a titallating swathe of the drawer-strewn nine volt. We all have our personal sentence streams and I prefer to leave grammar more on the banks than in the flow, although consciously, I know without the banks there is no flow and a fork on the wrong side of the table often breeds more condescension than a name-dropping vignette stuffed with Europeon capitals and self-praise, or worse, a sunflower seed stuck in the teeth of an operatic kiss. No Maestro! No. The cigarette burn in La Guernica! The nose shot of the sphinx by Napoleonic adolescents. Babs! You have exposed me a naked charlatan selling nothing but castrol oil to cure upset stomachs. For this there is no remedy but I thank you for not so sheepishly drawing the curtains back to reveal. To reveal. A toast!!! To revelation! I love the IP address piano drops by the way ATP; nice touch. I would try to err on the side of caution here, ATP. You said the person causing trouble was switching IP addresses. If s/he is indeed able to switch IP addresses willy nilly, then the fact that s/he shares or fails to share an IP address with another person would not seem to indicate much of anything. Mind you, for all I know Owen is the offender. I just do not see how we can conclude this on the basis of an IP address. harry in shorts...believe it or not i clicked on this topic to read about the development of this property, not your poetry. there must be some alternative outlets for your tragicreative effusions. but inundating otherwise pertinent threads with your filibustering genius is plain self-indulgent. Thanks, but save your breath. I almost never post to these kinds of sites, so it won't matter if I'm not posting here. I'd rather while away the hours at k-dog anyway. Non Sequitars are the ambrosial fibers of existence. If you want to walk a perfectly straight line you will first have to straighten your feet with chicken wire, then place them in boxes and go trotting around on the equator and uh that's not so natural so I wouldn't recommend it otherwise the thread was perfectly abandoned pal. That's the problem with your post perhaps. Instead of complaining about why my post doesn't relate to the topic while your post doesn't relate to the topic why don't you add some relevance to the topic if the topic is of your immediate concern. In addition, whoever you are, I am deeply in love with you. I have to agree with L here. This blog has come to suffer from what I call Brownstoner Syndrome (BS, for short). Not long ago ATP was fresh and cool, and I felt it contributed to a sense of comeraderie among PLG residents. Now, however, it seems that someone manages to infect every thread with rude, negative remarks of some kind. It really is depressing. Far from objecting to your role as moderator, ATP, I only wish you'd moderate more aggressively. Yes, unfortunately there is some negativity, Elise. In fact "L" told me my comments "disgusted" her and that she was "ashamed" to be my neighbor. She also said that I should move elsewhere (even though I've lived in Brooklyn for almost two decades). That's pretty negative, don't you think? And why? I was merely pointing out to numerous residents who have expressed an interest on this blog in turning Rogers Avenue into a Restaurant Row that a housing project may not fit so harmoniously.